It can be tough running an empire, but take some advice from Darth and come to the dark side to start your morning off right - they have bacon. The overlord of your house will feel comfy and cozy in these fun Star Wars lounge pants sporting the Imperial Logo and Storm Trooper helmets. Worn with a humorous red cotton t-shirt featuring Darth Vader with a fistful of bacon, they'll be no question of who's in charge. When warding off an evil chill this black imperial robe with serve it's purpose, but why not serve up a cup of joe in a "company" mug. The Star Wars Imperial Logo Mug is a must have for any dark side kitchen. 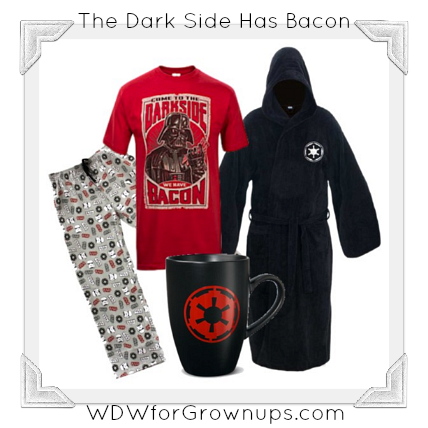 So come on over to the dark side - we have bacon!